"I have come to the abstractions of politics through the flesh and blood of individual behavior. I didn't know what politics was about until I saw it all happening to people." In this 1965 interview, Nadine Gordimer assessed her political consciousness with a self-scrutiny that characterized much of her political writing. In her novels and short stories Gordimer has captured the "flesh and blood of individual behavior" in minute and sentient detail, chronicling daily life in South Africa under apartheid, and portraying the human face of resistance. Gordimer grew up in a small gold-mining town near Johannesburg, the daughter of a Lithuanian Jewish father and an English mother. Although she read voraciously during her early years, she was taken out of school at age ten because of a perceived heart ailment; she had little formal schooling. Trailing her mother to afternoon teas, the lively Gordimer spent her time observing and mimicking the people she would later portray so astutely — the "well-meaning" members of white South African society. By age 15, when her first story appeared in an adult journal in 1939, Gordimer was already a seasoned writer of children's stories. A new world opened to Gordimer in 1949 when she began taking courses in Johannesburg at the University of Witwatersrand. There she mixed with musicians, journalists, and writers, crossing for the first time the color line that segregated blacks from whites. As she read the philosophies of Marxism, nationalism, and existentialism, she began to question the social structure of apartheid. She also became involved in the political and cultural movement of the Sophiatown renaissance, which produced the literary journal Drum. During the same year that she started classes in Johannesburg, Gordimer published her first book of short stories, Face to Face. Her first novel, The Lying Days (1953), was a loosely autobiographical coming-of-age story. She gained international recognition when her stories were published in The New Yorker magazine during the 1950s. A prominent critic of apartheid and an open supporter of the African National Congress, she continued to live in South Africa under apartheid despite the repeated banning of her books. The remarkably prolific Gordimer has published 12 novels and 13 short story collections. In the words of critic Stephen Clingman, her writing has represented: "the rise to power of the National Party in 1948; the life under apartheid; the political, social and cultural world of the 1950s; the sabotage and resistance of the 1960s, as well as their defeat by the state; the rise of the Black consciousness movement in the 1970s and the Soweto Revolt; the revolution which seemed to have begun by the 1980s." In her well-known novel Burger's Daughter (1979) Gordimer examines the political choices made necessary by the heroine Rosa Burger, the daughter of two communist revolutionaries, who finds herself ultimately unable to opt out of political commitment. Like two of her earlier books, Burger's Daughter was initially banned. 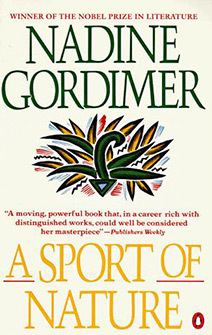 Without compromising her realistic portrayal of the political world, Gordimer also explores the realm of sexuality in works such as the Late Bourgeois World (1966), July 's People (1981), and A Sport of Nature (1987). Under a political system where the body — skin color, hair texture, facial features — defines identity, she has argued that the political and sexual are inextricable. Her narrative style influenced by such Russian authors as Turgenev, links the social, political, and personal. Using the gestures, words and thoughts of her characters, she portrays "a society whirling, stamping, swaying with the force of revolutionary change." In numerous essays, collected into four volumes, Gordimer has commented on the politics of writing, and the evolution of leftist political action. She has also written on aesthetics and literary criticism, and on her own travels around a rapidly changing continent. In her autobiographical essays she probes and scrutinizes the evolution of her own thinking — always with a self-critical gaze at her own position as a white woman. A self-proclaimed political radical, Gordimer was one of the most visible opponents of apartheid for those outside of South Africa. With a long-established readership abroad, her words have reached a broader audience than most black authors writing on similar issues. Her international reputation, particularly after she won the Nobel Prize for literature in 1991, has protected her from some of the reprisals that faced other South African radicals. After receiving the Nobel, Gordimer spoke about the responsibility she felt came with such international prestige: "I have two roles in my life — one as a writer and another one, my commitment to the cause of freedom in South Africa and creating a new postapartheid culture in South Africa." In her most recent novel House of Gun (1998), Gordimer highlights the interpersonal relationships that have always been a major part of her work, setting the story within the climate of violence that continues to mark postapartheid South Africa. Contributed By: Marian Aguiar "Gordimer, Nadine," Microsoft® Encarta® Africana 2000. © 1999 Microsoft Corporation. All rights reserved.